Against the Ropes was another visual assault of awesome in this vivid book cover. 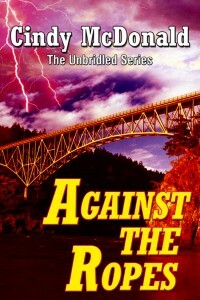 Part of the Unbridled Series by Cindy McDonald, the cover captures a dramatic vision of the bridge while lightning falls around the terrain to give the cover some drama. The overall redness in the image showed an urgency that works well with many mystery or action genres. To view full cover, click the image. Hot Coco by Cindy McDonald, NEW book cover image!